TSG 1899 Hoffenheim could climb out of the automatic relegation places for the first time since the beginning of October if they beat FC Augsburg on Wednesday (kick-off 20:00CET/19:00GMT). The Sinsheim outfit come into the game on the back of a spirited display in an eventual 3-1 reverse at Borussia Dortmund and will fancy their chances of registering back-to-back home wins for the first time this season. Another three points, coupled with a defeat for SV Werder Bremen at fifth-place Bayer 04 Leverkusen, would see Julian Nagelsmann’s side leapfrog the Green-Whites into 16th. 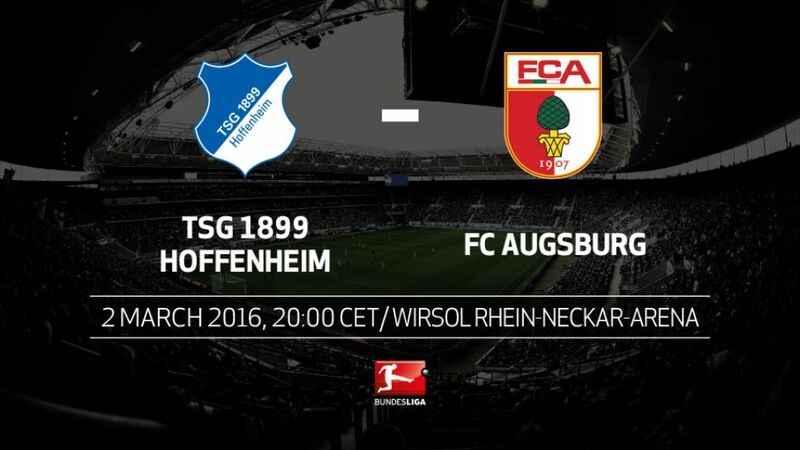 Augsburg, however, have proved difficult to beat on their travels this season. Die Fuggerstädter have only lost once away from home in the league since Matchday 10 - a 2-1 loss at FC Ingolstadt 04 nearly a month ago - and could take a huge step towards top-flight safety with victory at the WIRSOL Rhein-Neckar Arena. Augsburg have collected 13 points from their last six away games.Hoffenheim recorded their biggest win of the season so far at Augsburg on Matchday 8.Despite losing that match, Augsburg registered more shots at goal (26) than ever before in the Bundesliga.The Sinsheimers have lost only two of their seven games against teams currently in the bottom third of the table. Both those defeats were at home, though (against Bremen and SV Darmstadt 98).Hoffenheim have dropped more points from winning positions than any other Bundesliga club this season (22).Having picked up just two points from their first four matches this term, Augsburg have collected four points from their last two encounters.Hoffenheim are currently nine places below their final league position in 2014/15. Augsburg, meanwhile, are eight places further down the table.Hoffenheim coach Nagelsmann grew up near Augsburg and featured for FCA’s youth and reserve sides during his playing career.Die Fuggerstädter last won in Sinsheim on 21 October 2005 (3-1), when both clubs were still in the third tier.